Lumberjerk Records is putting out its first compilation, Strait Outta Comp, and it combines two of our favorite things: good music and a good cause. The label, and its forthcoming compilation, are the brainchild of Justin Weir (of Celebrations Guns fame) and features a smorgasbord of Arizona alt- and indie- artists, including Citrus Clouds, Twin Ponies, dent, The Lonesome Wilderness, Instructions, Sun System, Paper Foxes, Holy Fawn, and many others. All the proceeds are going to a program that helps fund “teachers that need school supplies or other classroom projects.” How rad is that? So, we’re super excited to premiere this new compilation. And, we also got the chance to ask Justin about the release and Lumberjerk Records. 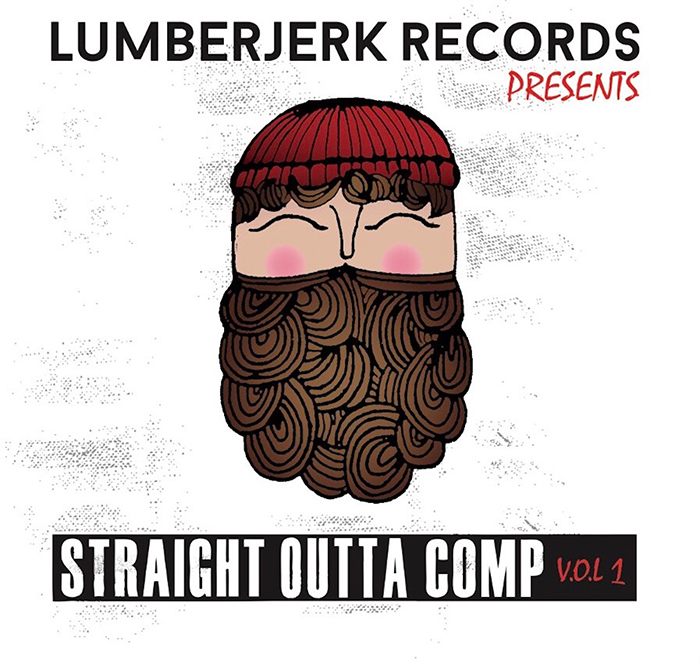 Check out the premiere of Straight Outta Comp from Lumberjerk Records right here and check out our Q&A with Justin Weir below. AND don’t forget to head out to the release party this Friday at The Rebel Lounge! YabYum: So, tell me what led to the formation of Lumberjerk Records? Justin Weir: Lumberjerk Records was an idea I had a little over 5 years ago when a friend of mine jokingly referred to me as a “Lumberjerk”. It could be the beard, the plaid shirts, or maybe I’m a little jerky. 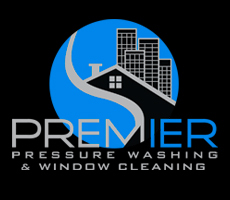 I thought it was a great name for a record label but logistically I didn’t know if I would ever follow through with it. Fast forward to 2015 and the formation of “Wet Lab” at the Rock Lottery. Jim Adkins was featured on vocals and there was a slight buzz about it, so my friend Josh Rodriguez (SELECT shows) and I thought it would be a good opportunity to start a label to release a cassingle featuring two of Wet Lab’s songs. The cassingle was released for charity to benefit Rosie’s House: A Music Academy for Children (the same charity The Rock Lottery donates to). Josh and I decided on the name “Saint Joseph” because so many people we know in AZ (ourselves included) were born at Saint Joseph hospitals. Since we were releasing music born in Arizona, it seemed like the perfect name…and my idea for Lumberjerk Records was pushed to the side. After releasing a few more tapes and CDs through Saint Joseph, I began to lose interest in the concept of the label and didn’t feel a strong direction for it. I decided to create a new identity and style for the label and bring it back to my roots: Lumberjerk Records. Around the same time we were planning a compilation featuring Arizona bands and decided that the release of the compilation would perfectly coincide with the launch of the label. And like the beginning of Saint Joseph, this label is starting off with a release that will benefit a good cause. 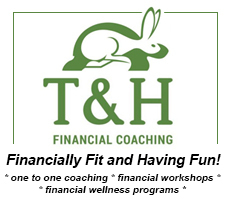 Can you tell us about the organization you choose to support and why? The organization our compilation is supporting is donorschoose.org. Donors Choose exists to support teachers and classrooms with supplies and projects. Similar to a “Go Fund Me”, classrooms will create a page listing specific needs they have and pick a specific dollar amount needed to meet their goal. Projects can range from funding basic school supplies to educational field trips. Since we live in a state that has been listed as the worst state in the nation for teacher pay and seemingly places little to no value in supporting education, it felt important to me to join this cause. My sister is a teacher in Eloy and I work at a local University, so education is a big part of my life and I hope one day Arizona will begin to provide more support and take education seriously. Some super cool bands appear on this compilation. Is it unfair to ask if you have any personal favorites? Either way, any personal favorites? It is completely unfair but I’ll take the bait. Twin Ponies are long time friends of mine so I was really excited to have them be a part of it. I really dig the songs that Holy Fawn and Instructions contributed. Sun System were one of the first bands to sign on to the comp and they’re fantastic. In conclusion, all of the bands are talented and total sweethearts and I love all of them equally. To kick off the release of the compilation, Lumberjerk Records has arranged a pretty sweet show at The Rebel Lounge later this week. Care to tell folx what they can expect at the release show on the 3rd? First of all, I feel really good about the way you spelled folx. 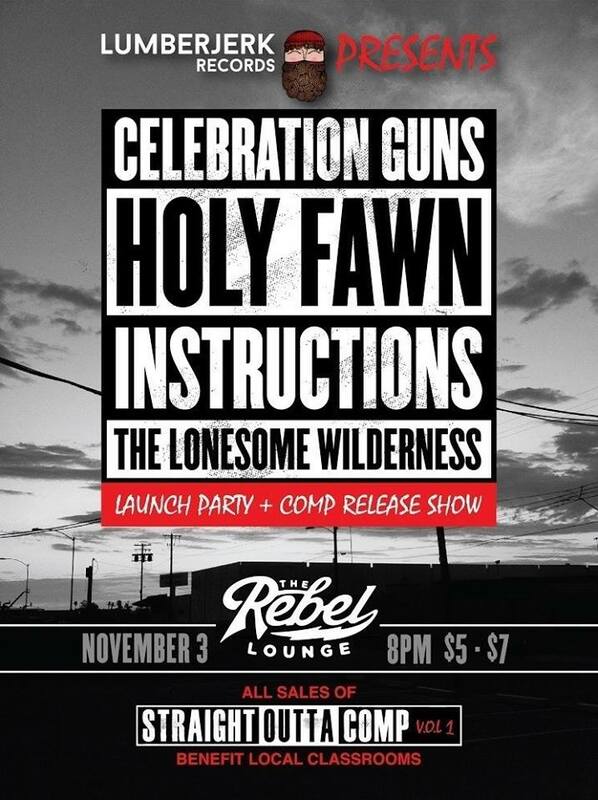 The release show at Rebel will feature Celebration Guns (full disclosure: this is also a band that I play in), Holy Fawn, Instructions & The Lonesome Wilderness. It’s $5 advance/$7 at the door so we’re trying to keep it reasonably priced with a pretty solid lineup of bands. Any extra money we make from the show will go to DonorsChoose.org. We will have CDs and tapes for sale and 100% of what we make will go to Donors Choose as well. 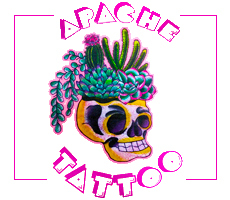 We will have free stickers available that we hope will be placed all over town. It’s going to be a fun night! Now did you curate the list of artists that appear on the comp or did you put out a call for participants? The compilation actually started out as an idea for a split release between Celebration Guns and LUAU. We then started talking about making it a 3 or 4 band split including Sun System. Then the whole thing got out of control and there are now 12 bands on the split. We decided to only feature songs that are considered new releases. We looked to bands that were released on Saint Joseph and are still active so Paper Foxes and The Lonesome Wilderness joined up with us and Charles’ (from Saddles) side project “Actual Baby” is our opening track (LUAU will have a new song on vol.2 of the comp…yup, there’s going to be a volume 2!). I then started talking to friends or bands that we play with often (Twin Ponies/Holy Fawn/Dent/Instructions) and finally I started thinking about local bands that I’ve had an eye on and really enjoy what they’ve been doing (Strelitzia/Citrus Clouds/Good Ol Joel). I’m hoping volume 2 will feature a ton of other bands we haven’t worked with yet and possibly even have twice as many songs?